Infographic – Vaping overtaking Nicotine Patches and Gums? This infographic illustrates how the latest research shows a trend in which the use of vaping devices such as e-cigarettes are overtaking nicotine replacement therapies such as nicotine patches and nicotine gums. 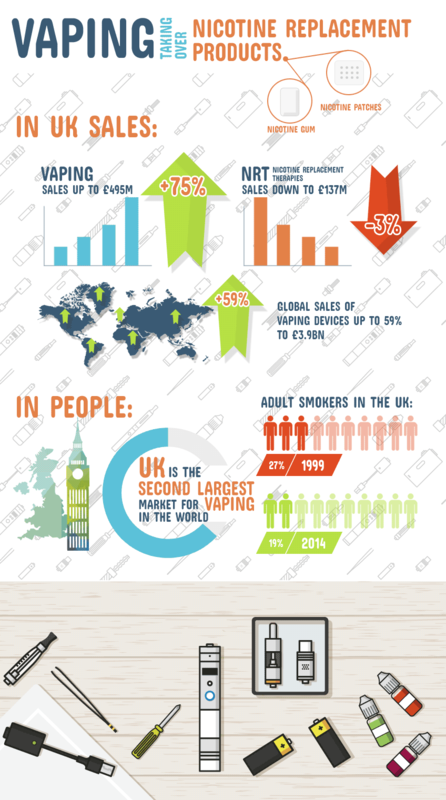 The UK has witnessed a decline in the number of people using nicotine replacements as more British smokers choose vaping devices such as e-cigarettes as their choice for kicking the habit Although the infographic presents the stats primarily for the UK, the trend is also being echoed globally, specifically across the US and Europe. Can You Vape in Pubs? How Many Celebs are Vaping?